Clinton areas including Hell’s Kitchen and the Mid-town, Times Square area of Manhattan. 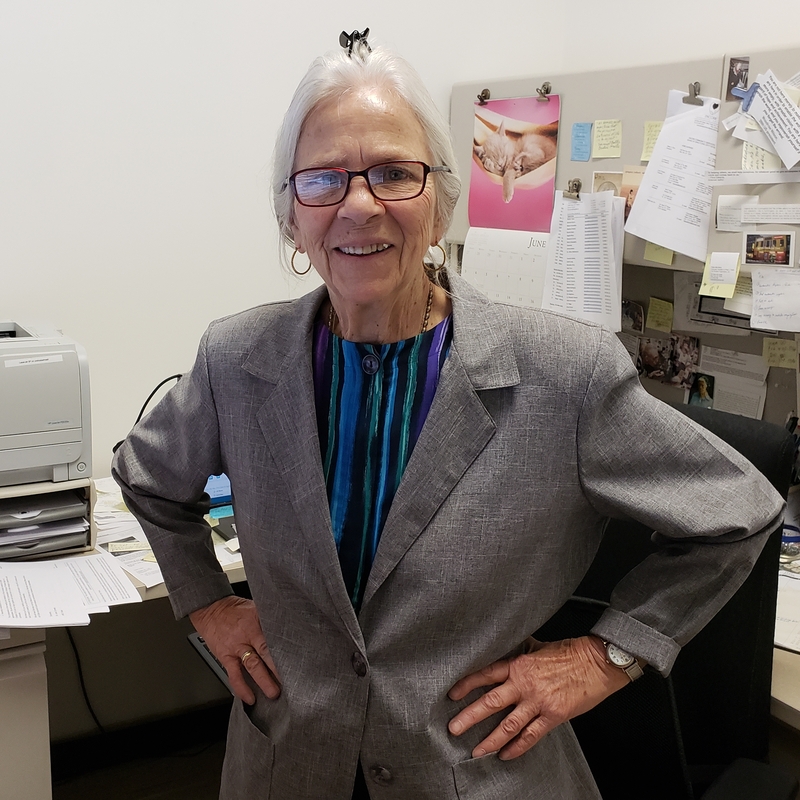 Her presence on Community Board 4 for 11 years and her leadership as the Chair of the Land Use and Zoning Committee for several of these years made her far more visible and extremely respected by those she worked with and came in contact with. She made many friends for Encore and formed many alliances with both neighborhood and politically connected figures alike, as they felt she was extremely honest, smart and had no hidden agenda but that of serving both the aging and non-aging members of the community. Her reputation even extended to some local corporations, JC Penney being one of them, as many corporations at that time were establishing “nonprofit cause departments”, to begin contributing to the neighborhoods they were housed in. They were looking for competently run organizations and services for their investments both financially and with employee services. Sr. Elizabeth also joined the local Police Precinct Committee, the consulting board of St. Vincent’s Midtown Hospital on West 52nd St., the Mayor’s Midtown Citizen’s Committee, Times Square Business Improvement District Committee and a number of other committees that made up the local aging network. 1979 – 1986: Sr. Elizabeth and staff began building programs, expanded outreach into the community and increased fundraising capabilities, all to meet the ever growing needs of NYC’s elderly. Sr. Elizabeth spearheaded Encore’s sponsorship of the conversion of the old YWCA building on 8th Ave. between 50th and 51st St., to a HUD Section 8 Program with 250 apartments for low-income seniors. She worked tirelessly with Fr. George Moore to have Encore incorporated as its own 501 (c)(3) Nonprofit Organization. This would give Encore the ability to widen its fundraising reach and give more stability to Encore as it expanded its services and personnel. She stepped forward to become the full-time Executive Director of Encore while also having the responsibility of Encore’s Development Program, tasked with the main fundraising responsibility. 1987 – 1989 was a time of change in Encore’s History as supportive housing for homeless elderly became another need that daily presented itself at Encore’s doors. The ever increasing homeless population especially among the elderly moved Encore to address this issue, giving rise to the Encore 49 Residence. Fr. George and Sr. Elizabeth worked tirelessly with the builder, William Zeckendorf, through the construction period that took the old Markwell Hotel on 49 St. between B’way and 8th Ave. to what was to become the Encore 49 Residence for formerly homeless elderly. Needless to say there were many difficulties, one being the budget for the project. The budget proposed was far short of what was needed to achieve the goal of adequate housing. It would not be easy to move the initial offer of $200,000 for the rehab, to the final cost of $1,000,000 plus, but move it did. Neither Fr. George nor Sr. Elizabeth would budge until they got most of what they wanted. Together, they were a force to be reckoned with. 1989: The Encore 49 Residence officially opened its doors to 89 formerly homeless elderly. With grants from the NYC Department of Health and Mental Hygiene and the Department of Homeless Services, a Social Service staff was put in place to provide the tenants with mental, emotional and physical support along with much needed social interaction. It allowed 89 elderly homeless to move from the streets and shelters, where a number of them became victims of violence, to a home of their own. 1990 – 1993 was a time in Encore’s history that required both the status of Encore as an organization and the credentials of its administration to be brought to another level. There was also a focus on the need to increase Encore’s fundraising capabilities. During that time steps were taken to do exactly that. May 3, 1991: After an 8 year struggle with cancer, “The Music Stopped” with the death of Fr. George, Co-founder of Encore at the age 64. This was a blow to all, none more than Sr. Elizabeth, who was now given the task of incorporating the wonderful work of Fr. George with her own and the rest of the staff. 1991: Encore received a grant of $250,000 from the Portman Fund through the efforts of Community Board 5 in which the Encore 49 Residence was located. As a true community activist, Sr. Elizabeth built a good working relationship with a number of Community Board 5 members, many of whom lived or worked in the neighborhood. 1991: Sr. Elizabeth attended Columbia University to receive her Master’s in Social Work, later to be certified as a Licensed Master Social Worker. This was all done to further advance the mission of Encore, allowing it to grow in stature and independence. Encore 49 HDFC received a preliminary ruling as a 501(c)(3) from the IRS and signed a 10 Year lease with St. Malachy’s, allowing Encore’s Senior Center and services to be secure for many years into the future. An Endowment Fund was created by the Board with a bequest from a senior of over $150,000. 1992: A full time Development Director, Gina Curran came on board as Sr. Elizabeth realized she could no longer bring in all the funds needed to address the ever growing programs needed to address so many issues faced by the elderly in NYC. This led to a great fundraising partnership that continues to this day. 1992: Sr. Elizabeth attended Columbia University’s School for Nonprofit Management. It was recognized that with the growth of Encore’s services and staff, it was necessary to bring a new dimension to both administration and financial management. This would prove invaluable in the restructuring of both of these areas, needed to address the current and future needs of this growing organization. incredible work and insights in moving Encore at St. Malachy’s, a small community based agency, to Encore Community Services, an organization that broadened its outreach to a much larger area on the West side of Manhattan. •	Initiating a Capital Campaign for major renovations to the senior center. •	Completing renovation to the Senior Center, now handicapped accessible in 1996. •	Taking over Crossroads Senior Center located at St. Luke’s Lutheran Church on West 46th St. NYC and after 5 months merging the both programs at the Encore Senior Center. •	Agreeing to partner with Citymeals-on-Wheels for a weekend home delivered meals program. 2001 – 2009: Both Encore Community Services and the world saw drastic changes that require new forms of coping and a new set of strengths and strategies to keep moving forward. But move forward we did. 2001 World Trade Center tragedy occurred. As Encore was fairly close to the epicenter of this disaster and the trains only resumed operation at 49th Street, many people who walked up to the trains nearby, made their way to Encore just to rest before continuing on. The seniors and staff were unbelievable to all of them. Included in these folks were a number of firemen from our local fire station 2 blocks away. Over the years a strong bond had been formed with the firemen and their families as Encore hosted a number of their family events. On this day they needed to come to St. Malachys and Encore, hoping to make sense out of what had just happened as they had lost 14 of their men and emergency service people. They were in tears as was the staff and seniors, seeing the pain on their faces and feeling so helpless. In the months to follow, the ties became even closer as seniors and staff reached out to the local firehouse with food, money and any additional supplies they could muster up. In turn the firemen, who soon were flooded with food and more supplies than they could use, sent all the extra’s to Encore for our use. Although most of the original firemen have left, to this day the strong bond still exists. YAI/National Institute for People with Disabilities contacted Encore to propose a joint effort with YAI to see if they could mainstream some of their folks with Encore services as an alternative to sheltered workshops. Encore was completely open to it, so a joint program between Encore and YAI began. As part of the program, YAI participants began delivering homebound meals accompanied by counsellors and assisting with the senior center lunch program. This program has been a great success over the years and continues to this very day. In 2005 Encore West Residence Housing Development Fund Corporation was established by Encore Community Services to oversee and administer the funds for the development of the Encore West Residence on West 51st on 10th Ave. This funding came through a HUD Section 202 program, which provides housing for very low income seniors. The funding covered capital financing, construction, operating costs and subsidies for rental assistance. Through it all, Sr. Elizabeth was the main person involved in all transactions, that included working closely with Community Boards 4 & 5, local community leaders, residents and businesses. As Encore West was to be built on city redevelopment land she was able to obtain the land for $1.00. She also assisted local businesses that shared the same square block of redevelopment land, in order for them to remain and have rents they could reasonably afford. Their cooperation with Sr. Elizabeth and her cooperation with them assured that all parties could remain on the last piece of redevelopment land in Manhattan. To this day, she is held in the highest esteem by all who worked with her in this process. 2007 saw the Grand Opening of Encore West Residence. With its completion, the ceremonial Ribbon Cutting took place and had many city and state dignitaries, a large number of community residents, Encore Staff and Board of Directors, staff from other non‐profit agencies, local clergy, members of the DFTA and HUD Administrations and a number of business owners who had been working with Sr. Elizabeth on this redevelopment land. 2007: NYC Department for the Aging went through restructuring mandated by Mayor Bloomberg as a large cost saving measure. The restructuring threatened the closing of many Home Delivered Meals Programs in the five boroughs, with only a handful of programs to remain. These programs would have to increase their services and footprints in order to cover the many elderly clients previously covered by the closed programs. At the same time the on-site (congregate) programs were threatened with drastic downsizing, which could critically affect or dismantle senior center services including the on-site meals. Encore files an RFP for the Home Delivered Meals Contract for Community Boards 4 and 7. After much soul searching, Sr. Elizabeth and her Executive administration made a determination to go for it. With the help of a major contract and financial consultant, she took the risk of applying for the city’s RFP for all the senior Home delivered meals in Community Boards 4 and 7 stretching from 14th St. to 110th St. and from the river to 8th Ave. This required the assistance of a sub-contractor for part of board 7. It was also decided to sub-contract with another agency that now has the contract for Community Board 5, as Encore was physically situated in board 5 and had served seniors in this area for many years. Doing this Encore’s footprint increased a hundred fold. Encore took this big leap, with strong determination, hard work, good people and a firm conviction that whatever Encore puts its mind to it could do. In 2009, Encore was awarded the official Home Delivered Meals contract and began a new expanded program, rolling out its vans to cover the extremely large area needing Encore’s meals. These meals included those seniors requiring Kosher meals. Encore Senior Center was finally safe from closing. With the introduction of a new NYC Department for the Aging Commissioner, Lilliam Barrios Paoli, reasoning finally returned to the Mayor’s Office, leaving a large number of Senior Centers intact, unlike the Home Delivered Meals Programs that had been drastically cut. 2010-present: Encore continued and still continues to move forward, increasing its programs, the number of seniors served and the needed staff, equipment and supplies required to carry out this service. We have been blessed and we know this blessing will move forward into the future. We also know that many of these blessings have come through the hard work, determination and faith of Sr. Elizabeth and her Executive team. For this we are truly grateful.